I love limited edition collections, there’s just something about being able to get your hands on something that is exclusive & only available in limited quantities. LUSH always think of the most amazing and magical items for their holiday collections (Easter and Valentine’s Day are usually my faves). 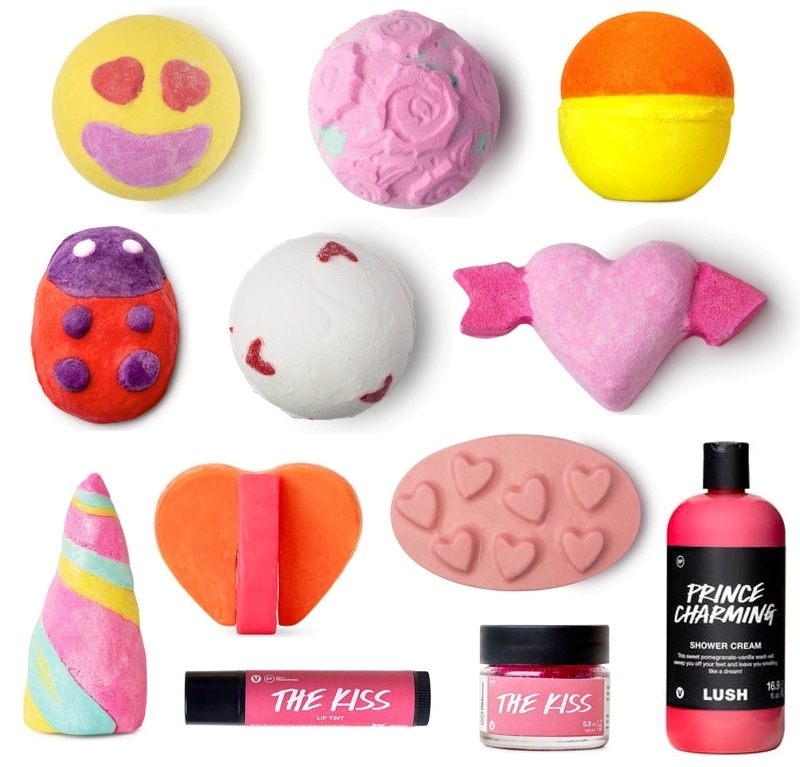 This year I was quite surprised to see LUSH South Africa managed to bring almost the entire Valentine’s Day collection to our shores – yay! If you want the inside scoop on which of the V-day products will be available tomorrow, keep reading! Most of the items in this year’s collection are brand new products – please keep in mind I haven’t used most of the products in the collection (except Unicorn Horn Bubble Bar, Prince Charming Shower Cream, and The Kiss Lip Scrub), so the descriptions you see below have been taken from a press release. I did, however, link to the reviews I’ve written on some of the products. Oh, and remember: You don’t need to have a special someone in your life to have a reason to buy anything for Valentine’s Day! Before I met Neal, I was single for a VERY long time (boys used to bore the heck out of me) and I always made a point of buying myself a nice spoil for Valentine’s Day. I’ll probably buy a couple of the LUSH Valentine’s Day goodies tomorrow, a special gift “From Me, To Me”. Unicorn Horn Bubble Bar | R62,50 | review | Unicorns are probably real. But, even if they’re not (don’t worry they definitely are) you won’t mind! Relaxing lavender oil meets mood-brightening neroli in this lustre-filled bar. Neroli oil increases serotonin levels in the brain which makes us feel contented and cheery, so you can ponder the existence of magical creatures while building a fairytale landscape of feel-good, fragrant bubbles. Over And Over Bath Bomb | R69,50 | No it’s not all in your head. This enlivening cocoa butter coated lime and fennel oil bomb will perk you up and leave you thinking ‘bout it over and over again. Be mesmerised by its hypnotic rocking and rolling, as a vibrant citrus firework of pinks, oranges and golds unfurls into your bath. Cupid Bath Bomb | R49.50 | Be still your beating heart with an opulent bath time bouquet of calming rose and bergamot. This fantastically floral fizzer is full of uplifting bergamot, rose and violet leaf absolute, and its subtle sweetness is sure to melt your heart as it melts into your bathwater. Lover Lamp Bath Bomb | R69,50 | Off with the Fair Trade organic cocoa butter hearts! Watch them melt and coat the skin in heavenly moisture while its citrusy fragrance of Brazilian orange oil and vanilla absolute lifts your mood. Rose Bombshell Bath Bomb | R62,50 | Love is blind, which is a shame because this bombshell with a floral triplet of yellow rose petals, rose absolute and rose oil is an enthralling spectacle. As it fizzes, the outer shell breaks away and magnificent petals burst out in a sweet haze of Sicilian lemon and floral geranium oils. Lovestruck Bubble Bar | R72,50 | Words can’t describe how much you love them, but emojis filled with lemon and geranium sure can. If you heart bubbles, crumble under running water – you’re sure to ‘Like’ the result. Warning: These refreshing citrusy suds may make you feel Emoji-nal! Ladybird Bubble Bar | R62,50 | Snug as a bug in the tub! This friendly little ladybird wants to take you under its wing and run you a hot floral bath, filled with sweet geranium oil to aid relaxation. A little peppermint oil gives a menthol hint to this flowery mix, helping to revive and uplift mind and body as you soak. Go all out for mountains of cheery bubbles or save a little for next time. Two Hearts Beating As One Bath Melt | R75,50 | Set your spirit free with a union of ylang ylang and rose oils, and be mesmerised as they dance their dizzyingly floral first dance in your bathwater. And, while all eyes are on the coral and magenta magic unfurling in your tub, an entourage of softening organic cocoa butter and almond oil will bestow your body with a conditioning caress. Love Spell Massage Bar | R120,00 | Follow your heart straight to this creamy, Fair Trade, organic cocoa butter bar, filled with rich rose hip syrup and spicy carnation absolute. Fair Trade organic aloe vera gel soothes your blushes while uplifting neroli and organic lemon myrtle takes you to a higher plane. Cast a spell over a skin, or over a partner, with this romantic, floral bar. Prince Charming Shower Cream | R95,00 | review | Your search for a handsome rinse ends here. Whether you’re awaking from a particularly long slumber or prepping for the ball of the century, sweet marshmallow root and vanilla pod infusion will sweep you off your feet. And who needs a shoe as a souvenir? Invigorating fresh pomegranate juice and grapefruit oil will linger on skin for longer than any glass slipper could last. The Kiss Lip Scrub | R105,00 | Giving some sugar? Make sure you get some in return. This smoothing blend of fine sea salt, caster sugar and Fair Trade cocoa butter will soften the skin and leave a delicious taste on the lips. A little almond and mandarin oil sweetens, and the edible hearts? They’re just for your enjoyment. Savour it all to yourself or share with your Valentine. The Kiss Lip Gloss | R95,00 | Kisses are so much sweeter when they’re infused with Fair Trade shea butter from the Ojoba women’s cooperative in Ghana. This soft, hydrating butter will moisturise your skin, while Kalahari melon and organic jojoba oils add a touch of the exotic. Organic illipe oil and agave syrup give a lovely slip and delicious shine to your lips too. Who could resist? In Your Dreams Gift | R185,00 | For the kind of sweet, floating-in-florals baths you’ve only seen in your dreams… until now. Two secret admirers are ready to take you to bathing heaven. Unwrap them! Contains… Cupid Bath Bomb, Unicorn Horn Bubble Bar. Love And Kisses Gift | R395,00 | Enjoy a night in that’s just like the fairytales. This quartet of enchanting goodies is ready to whisk you off your feet and bring fantasies of softened skin and sweetly-scented massages to life. You’re in for a happy ending. Love you to Rapunzel’s tower and back. Contains… Prince Charming Shower Gel (100g), Love Spell Massage Bar, Love You, Love You Lots Soap, The Kiss Lip Scrub. With Love Gift | R195,00 | Make a date with roses as two beautiful, romantic products come together to cleanse and condition your skin. It all begins with a slip of a ribbon… Two delightful treats will give you that rosy feeling. They’re sent with love. Contains… Ro’s Argan Body Conditioner, Love You, Love You Lots Soap. The LUSH Valentine’s Day 2017 Collection will be available in-store (here’s a link to the list of stores in South Africa), as well as in the LUSH SA online store on Friday, 27 January 2017. Go on, spoil yourself (or a loved one) this Valentine’s Day – you deserve it! I hope you managed to find both? 😉 Lovestruck smells so good! Thanks for the intro to what we can expect! EEEEEE!!! Cant wait to get my hands on some of these lovelies, I bet they smell amazing! Ooooh everything is so pink and lovely!! Been waiting for these ever since I saw them on Instagram a couple of weeks ago…..I’m so going to buy some of them, theyre so adorbs!!! The Unicorn Horn is on the top of my list !! The unicorn horn bubble bar was sold out so fast online that I couldnt get one, but I ordered some of the other Valentine’s themed products. Super excited to try them out. I just love lush!